T’ang Haywen during the visit in Pologne (1990). 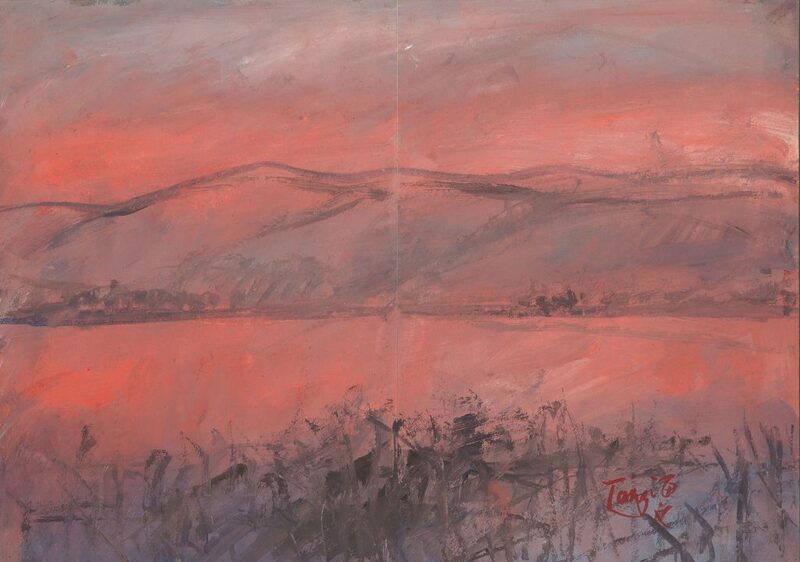 T’ANG HAYWEN was as luminous a figure as his painting could be, he had an astonishing vision of the world mixing great knowledge with profound simplicity. I had been introduced to Francois shortly before by Leszek, and this unpredictability, this abandonment to life, struck me at first sight, then during the whole trip, and every time I saw him again, until his death. His cosmopolitan ease, his keen interest in the art of his contemporaries, his eternal bumbag and his frequent shorts … his body so small, legs and thighs of a teenager, his ability to fall asleep, almost unbeknownst to everyone, taking advantage of certain breaks. And yet not once, on this hesitant and sometimes long road before the rest, did he lose the look full of attention and curiosity that he bore on everyone. When visiting the city of Lublin, Kazimierz Dolny or Kozlowka Palace, he listened attentively to our explanations. For him, as for me, this experience and this exchange proved of great value. 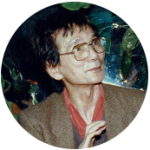 In Lublin T’ang was housed at Rena Targonska – a scenographer and important personality who worked for television drama, pantomime and had participated in several festivals in Poland and abroad. Among other things, she signed Carl Orff’s Carmina Burana theater adaptation in Cairo. “His memory of T’ang’s work is pretty well defined as a constant attempt to capture the feelings, those who leave their footprints in us forever.” (The Ultimo Viaggio – Exhibition in Rome in March 2006 – Gangemi Editore 2006). T’ang had moved into a room with a balcony. He liked to leave the door of his room and that of the vestibule open. He got up very early, at dawn, and immediately went to work. He painted on ink and water-based cards. Every morning we discovered a pile of leaves covered with his impulsive brushstrokes, a sort of graphic haiku. He did not cut the leaves with scissors, he tore them skilfully, along contours he traced with the fingernail or folding the paper. The edges of the leaves thus offered a naturally torn appearance, appearing as marked by a slight deposit of foam. T’ang used flying leaves of different qualities, immaculate whiteness, ready to accommodate the content and meaning. These morning sessions were part of a ritual that resembled a meditation. It was a gift and a necessity, as if the artist began to paint the snow, something ephemeral, free and whose content was multiplied, spinning as in a dance. T’ang thus captured a thought caught in mid-air, an astonishment, a questioning. His small figure, still hidden in the shadows, made him a being almost absent. Only piercing eyes full of goodness, as well as hands, were detached from the whole character. While visiting Poland, T’ang revealed his curiosity for the world and his sympathy for those who look at culture, and especially art in all forms, as bridges, and become messengers who allow communication between souls, this without omitting that we are also beings of flesh. “It will be his last trip. He then creates a series of inks inspired by the Polish atmosphere and, according to his style, mixing spontaneity and profusion” (The Ultimo Viaggio – Exhibition in Rome in March 2006 – Gangemi Editore 2006). Although most of his works suggest landscapes, there is barely, or rarely, a concrete representation of nature. Only a sign, a trace or a color can reveal the latter, suddenly giving strength and energy to the work.